Yesterday was a gardening day. The front garden was looking a little dull. Two garden beds had been lying fallow since late summer. When I say lying fallow, I should probably confess that it wasn't really a conscious regeneration strategy. More that everything died and eventually blew away. So after a trip to Bunnings for some smash-and-grab shopping in the garden section, I made it home with a big tray of pansies. In a turn-up for the books, I managed to plant the new blue pansies on the day of purchase. They should be thanking their lucky stars. There are four very sad-looking strawberry plants valiantly attempting to flower in the confines of little black plastic pots, still sitting in the backgarden. Next it was on to a task I have been putting off for ages. Pruning the hydrangeas. I'm sure they should have been done ages ago, but I have been shying away from it. You see I inherited four glorious bushes when we bought the house. Last year I got quite gung-ho and went chop-chop-chop. I have since learnt that "razing to the ground" might work for roses, but is a Russian roulette strategy when it comes to hydrangeas. Look closely for the big powerful buds, which will send up new canes and be absolutely fantastic. The new buds are formed in alternative pairs. Pick the fattest pair and prune to just above them. Do this all over the plant. The further you prune, the bigger the flowers will be. If you prune too hard, you won't get any flowers but you will get beautiful foliage. So I gave it a go, but chopped with trepidation. What if I had only selected the second fattest pair of buds on the stem? What will happen where I chopped and then realised that it was a single bud not a double? The responsibility was almost unbearable. I won't know the results of my handy-work for months. But I rather suspect it will be another year of My, what magnificent foliage. We were staring in guilt at our two strawberry plants from last year, still in their plastic pots, just today. Almost wish they would die, just so I have an *excuse* for ignoring them. And I don't prune NOTHIN'..
Good luck! I'm just glad my hubbie did the hydrangeas this year. 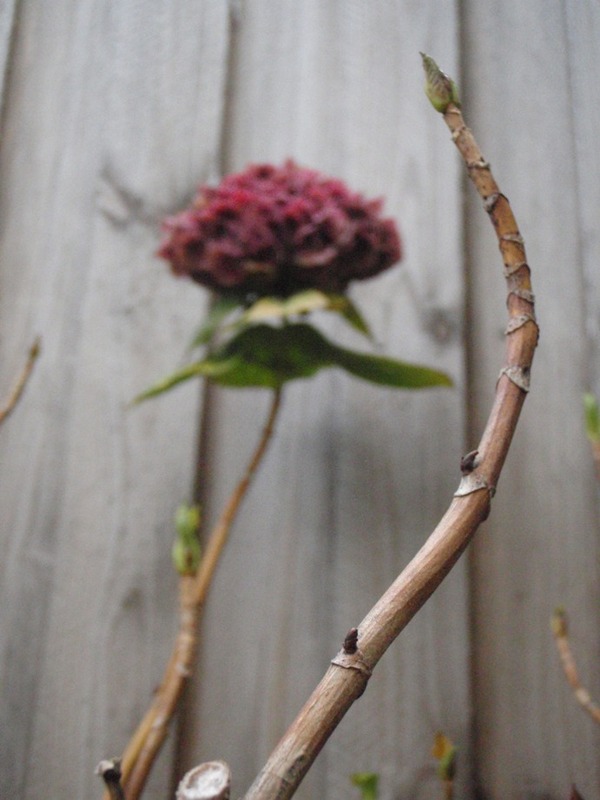 My tip is prune as far back as you can the branches that have the old flower heads on them and leave the ones with only leaves - but I'm not an expert! Bah, it'll work out fine! If it doesn't, well you've learned something for next year!